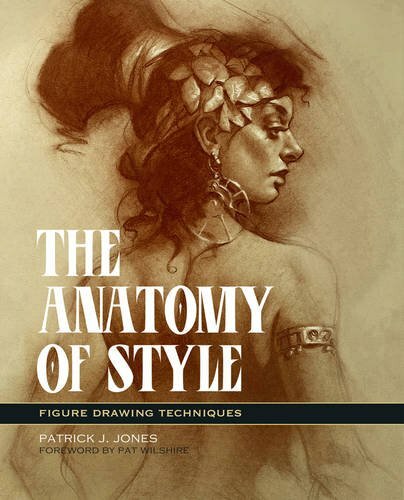 The Anatomy of Style by Patrick J Jones is a book for beginners learning to draw the human figure. This book is a collection of tips and techniques that he wished he had learned years ago. The content comes from his 15 years of experience as an artist and also from the art classes he teaches. This 160-page paperback has several chapters. The first chapter talks about the foundation of understanding anatomy. Here it has a lot of pointers in regards to specific landmarks on the human figure to look out for when you're drawing. There are tips to help you understand the form and structure, for the whole human figure and also in detail for each feature of the head. The other chapters covers poses and gestures, such as the use of contrapposto (aka counterpoise), how to make your figures more lively and less rigid, how to tackle life figure drawings with detail or with limited time, finding your own style, and using what you've learned to draw from imagination. There are many wonderful illustrated examples with notes, several step by step drawings with explanation. I find the instructions very insightful and the book definitely warrant repeated readings. When I went through the book, I was reminded of other anatomy books, such as Drawing the Living Figure, Figure Drawing: Design and Invention, Force: Dynamic Life Drawing for Animators, Anatomy for Artists: A New Approach to Discovering, Learning and Remembering the Body and some others. If you're an experienced artist, then perhaps you'll already know much of what's taught because the target audience for this book is for beginners. As a standalone book, the subject coverage is great. Overall, it's a very informative and helpful book on human figure drawing. Highly recommended.